The first step in how to draw dogs is to establish the basic shape (as shown below). As you can see its a fairly simple shape. The dog's face is almost shaped like an upside-down bicycle seat. Then you tack the ears on to that. 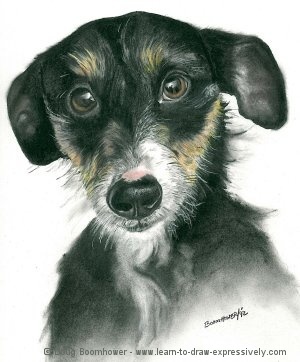 When you are preparing your dog sketches, the eyes and the nose are the most noticeable characteristics so be careful that you place them in the right place. This isn’t that difficult. It is a matter of close observation and practice. As I have said throughout this art website, you must let your eye guide your hand. Everyone can see. 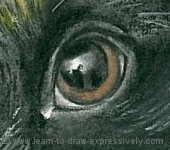 The trick is simply to let your hand record what you see, whether you are learning how to draw dogs, or for that matter, anything you draw. With practice, you’ll quickly become confident because it is naturally within us all. There is no mystery here. You see it ... you draw it. The dog drawing above was done in charcoal. Color was added with pastels and with white pastel chalk. The original image measures 14” x 16 inches. I intermingled charcoal, pastel, and white pastel chalk throughout. Pastel and charcoal were often layered. The white around the dog’s nose, the white highlights in the eyes, and the white in the body are the natural paper showing through. Note that the dog's hair changes direction to coincide with the underlying bone structure of the head. 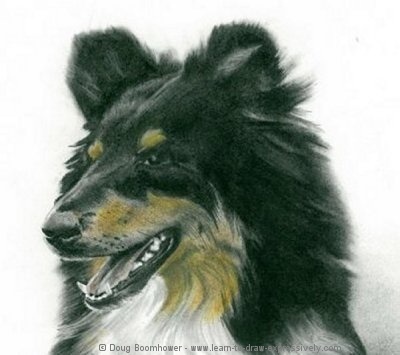 The most detailed areas are the dog's eyes and the dog's nose. I enlarged one of the eyes for reference. Note the complicated combination of reflections in the dog's eye. The actual highlighted area is the paper showing through. Close observation reveals some subtle tinges of blue, (blue pastel) interspersed in the charcoal. The darker area on the top of the pupil is a shadow which is cast from the dog's upper eyelid. I used brushes to to get that subtle blend in the highlighted area. I also used a sharp HB charcoal pencil to add just a touch of contrast. It is subtle attention to detail like this that adds to the overall reality. The same technique applies to this eye. This eye looks even softer because the whites of the eye are not showing. Notice the rubbery, wet look of the dog's nose. Soft 3B charcoal pencils and brushes were used, along with subtle additions of blue pastel. These softly brushed areas were contrasted against sharp lines created with HB pencils. 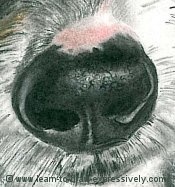 The highlight on the end of the dog's nose is an important touch of realism. I used pink pastel just above the nose. 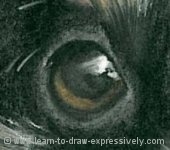 How to draw dogs convincingly, often calls for subtle details like this. 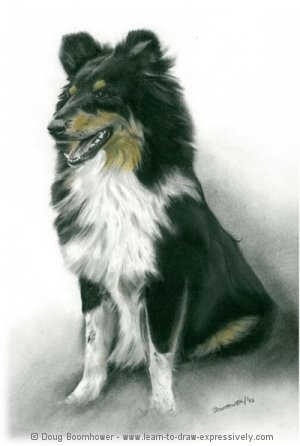 This border collie was drawn with charcoal and pastel. Note how real the dog's mouth looks. I used pastel to get the pink color of the tongue. Then I layered some subtle touches of charcoal on top of the pastel. This was done with brushes. Notice the teeth. I did this by drawing the negative space rather than the positive space. In other words, rather than concentrating on each tooth (positive space), I concentrated on the background behind the teeth (negative space). I used an HB charcoal pencil to create a clearly defined, sharp-edged area of shadow under the dog's tongue and behind the teeth. This clearly defined area left sharply edged shapes which implied the dog's teeth by leaving the white of the paper exposed. To suggest sharp teeth I had to create sharp edges...therefore I used a hard lead HB charcoal pencil. Want to see more animal drawings and animal sketches? How about this drawing of a cat?